A major new report by the Washington-based Center for International and Strategic Studies (CSIS) has laid out detailed plans for the Pentagon’s preparations for war in Asia. The report, entitled “Asia-Pacific Rebalance 2025: Capabilities, Presence, and Partnerships,” examines the range of threats to US dominance in Asia, but there is no doubt that its chief preoccupation and target is China. The CSIS document, released last week, has a semi-official status. It was commissioned by the US Department of Defence at the instigation of Congress under the 2015 National Defence Authorisation Act. The report is a follow-up to a similar CSIS study conducted for the Pentagon in 2012 following President Obama’s formal announcement of the “pivot” or “rebalance” to Asia in November 2011. Since 2012, last week’s report declares, “the international security environment has become significantly more complicated. China has accelerated the frequency of its coercive activities and the pace of its island building in the East and South China Seas.” After noting that US military interventions in Eastern Europe against Russia and in the Middle East have “competed with the Asia Pacific for attention and resources,” it stresses the importance of countering China. “Militarily, the Pacific Command has fully embraced the rebalance, but the [Chinese] anti-access challenge is worsening and China’s tolerance for risk has exceeded most expectations,” it states. The very terms used in the report are designed to present China as an aggressive, expansionist power and obscure the dramatic US military build-up throughout the Indo-Pacific over the past three years as part of the pivot. 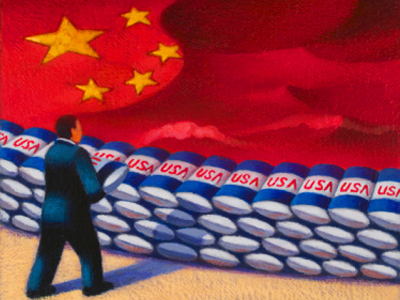 The phrase “China’s tolerance of risk” really means China’s failure to bow to sustained US pressure and provocations in the region and accept Washington’s demands. The Pentagon’s overall strategy for war against China, known as AirSea Battle, involves massive air and missile strikes on the Chinese mainland aimed at destroying key military assets, bases and infrastructure, as well as disrupting the country’s communications, economy and political leadership. It also involves an economic blockade of the country by cutting off shipping lanes, particularly those bringing vital supplies of energy and raw materials from the Middle East and Africa via the Indian Ocean and South East Asia. If China were to “forward-deploy” military forces on this scale permanently to waters off the Californian coast and openly discuss plans to annihilate forces on the American mainland, it is not difficult to imagine the belligerent and aggressive US response. Yet that is exactly what Washington is doing in the Western Pacific and more broadly in Asia. The 275-page CSIS study is devoted to a detailed and comprehensive analysis of what is required to speed up the US military build-up in Asia, to ensure maximum military support from regional allies and strategic partners, and to research and build new weapons systems to neutralise Chinese defence capacities. One element of the CSIS’s solution to the budgetary difficulties is to place new demands on other countries. The study examines in detail and in turn the role that each of the US allies and partners would be required to play, as well as the necessary expansion of their military forces and facilities. While focusing considerable attention on Japan, South Korea and Australia, it appraises a long list of countries, including India, Indonesia, Malaysia, Singapore, Thailand and the Philippines, as well as the potential for political resistance and opposition to US plans. Its recommendations include mechanisms to ensure the interoperability and integration of the various military forces into a US-led conflict against China. * Restructuring and consolidating US military forces in Japan and South Korea, including the completion of new bases, a major extension of military facilities on Guam, and the expansion of the American Marine, air and naval presence in Australia. * Stationing a second aircraft carrier strike group to complement one already permanently stationed in Japan, as well as “additional surface force presence,” such as Littoral Combat Ships, four of which are due to be stationed in Singapore. * Improving “undersea capacity,” such as the “near-term” stationing of two additional nuclear attack submarines in Guam and the future basing of advanced Virginia class nuclear submarines elsewhere in the region, including at Stirling naval base in Western Australia and the Indian Ocean base of Diego Garcia. * Expanding and reorganising the US Marine and Army forces throughout the region. * Boosting anti-missile systems throughout the region to neutralise China’s ability to respond to a US attack—nuclear or non-nuclear. * Undertaking major research aimed at countering any potential Chinese military response to US attack, such as a new generation of advanced, long range anti-ship, anti-surface and anti-air missiles, and the development of new weapons, including “three promising options”—railgun, directed-energy and upgraded conventional guns. Other projects include a new long range strike bomber, greater payload capacity for nuclear submarines, and augmented space, cyber and electronic warfare capabilities. The Pentagon’s watchword is that US forces must have the ability to “fight tonight.” In other words, the military must be able to launch a major war against China within hours and sustain it for whatever time is necessary. The massive expansion of the military budget required for this arms race will necessarily take place at the expense of the working class. This means the gutting of what remains of social programs and infrastructure and the further impoverishment of the working class. Both in the US and in each of its allies and partners, the turn to militarism will only intensify the class struggle. While the CSIS study makes no mention of the political consequences of its proposals, the boosting of the military abroad takes place alongside the build-up of the police-military apparatus, and police-state measures at home aimed against the eruption of social unrest.